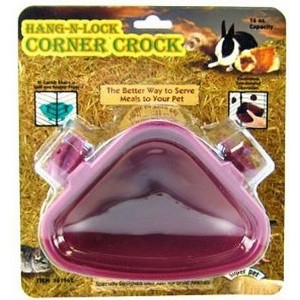 Super Pet Hang-N-Lock Corner Crock is the first food bowl specifically designed for small animals. It features two special brackets that securely fasten the bowl to any wire cage, yet simply detach to make refilling fast and easy. © 2019 Chestnut Vale Feed Inc./Hicksville Agway. All rights reserved.